Oz Funland is an enchanting amusement park that has been giving kids a magical experience for many decades. The inspiration behind this play and entertainment sanctuary is, just as the name suggests, the Wizard of Oz. This centre is home to the iconic Wizard of Oz show, which has been performed thousands of times across the globe. The centre pays its respect to the original storyline, living up to the expectations of many visitors who walk through its doors. Perfect for the whole family, Oz Funland promises an unforgettable family-friendly experience. Kick off the adventure with The Wizard of Oz show. Link up with Scarecrow, Tinman, Lion and Dorothy as they set off on a trip to find the Wizard in what is a highly interactive show. There is lots of dancing, singing and laughter, a truly magical experience. 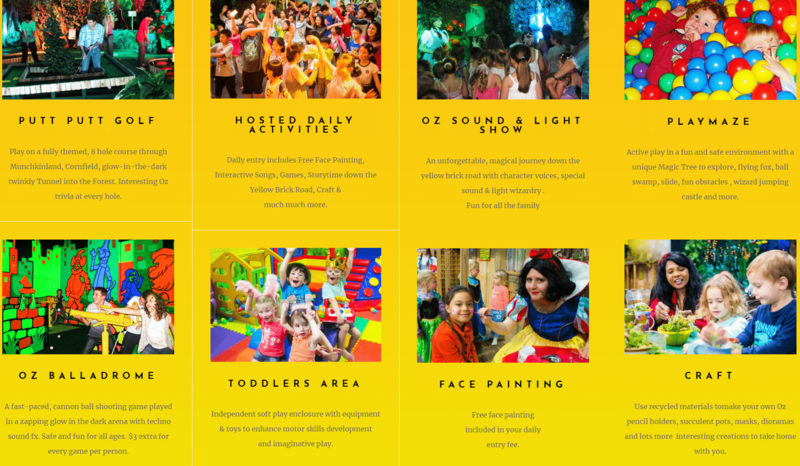 Add to these the photo opportunities available, and it is easy to see why Oz Funland is perfect for the whole family. Other fun shows include the Magical Christmas Snow Walk, The Wizard of Oz Sound & Light Show, as well as the Cinderella Princess Show. For kids who love games, there is a themed 8-hole course that goes through Cornfield, the Forest and Munchkinland – with a fascinating trivia at each hole. Daily activities include face painting, storytelling and an array of interactive songs. The kids can also let loose at the Playmaze; a fun environment for immersive play with a Magic Tree, flying fox and ball swamp. Visitors can also hold birthday parties here and private functions. Adults can enter free and the venue is wheelchair friendly. Unfortunately, outside food is not permitted, with the exception of birthday cakes for pre-booked parties.